I was thinking a lot about what made my strongest past work strong and what motivates me to create. A topic on which I'm always generating new theories. Sometimes I say "it's a common aesthetic quality, a matter of taste." Sometimes I say "It's because I crave artistic challenges and puzzles." Sometimes I say "It's all about educating people." But every time I come up with a generalization like that, I can see where it doesn't apply and I quickly throw it out. Then I realized that my FAVORITE work resonates on all three levels. An unconscious level, a personal level, and an interpersonal level. 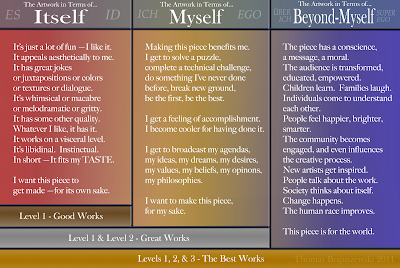 These three "levels of artistic consciousness" correspond roughly to Freud's idea of the "Structural Model" of the psyche — Id, Ego, and Super-Ego. and Das Über-Ich (The Over-I)." I personally translate these as "Itself, Myself, and Beyond-Myself." The similarities end at the names, though. I propose that these levels of art are modular. 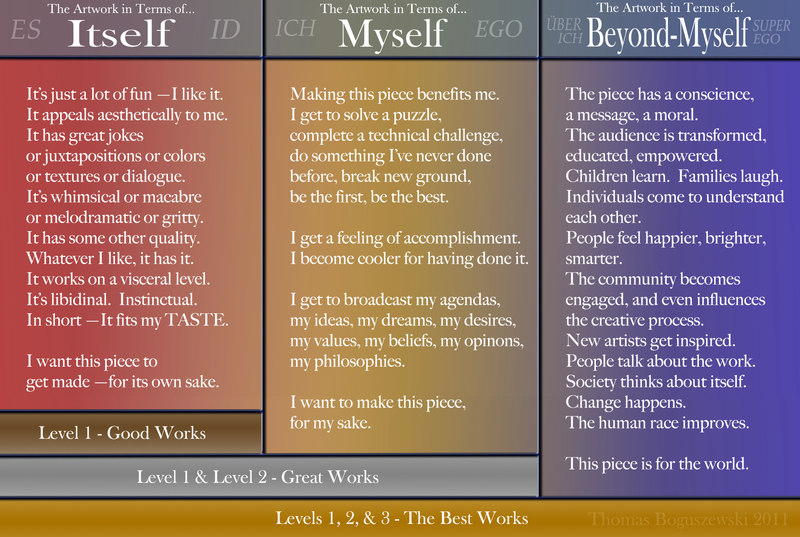 All art needs to tap into the "Id" level of creative consciousness before it can get off the ground. Otherwise working becomes drudgery. Nobody can do a good job on a piece they don't like! But after that, an artist can go FARTHER. Some do, some don't. Some take the artwork that they already enjoy and they make it into a personal expression of selfhood. That adds another layer of depth to it that makes good art great. Another important fold of my theory is that it's like a stack. You have to start from the base and build up. You can't skip steps or work only from the top. If you try to do work for the world without a visceral or a personal component it usually comes out a disaster. A piece won't work for the world if it doesn't work for you. As always. Comment, distribute, critique, let's discuss this theory. It's quite new so it might not be air-tight yet. *It's not necessarily best from a technical standpoint, but from a personal fulfillment and happiness standpoint. You're very unlikely to get sick of that portfolio item any time soon.